There is one thing that many people have always forgotten, which is to give their homes a touch of beauty. 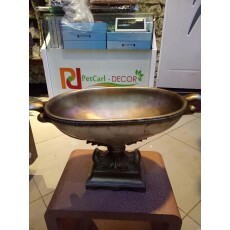 One of the majorly used decoration items that come with benefits is a decorative resin fruit bowl, an item that may impersonate a stone or metal, but in reality, it is a rotationally molded product. Resin fruit bowl is mostly used in the dining room to display both artificial and natural fruits. A synthetic resin is what is referred to as plastic, however after being given a touch of beauty by expert manufacturers, resin fruit bowl became more appealing and highly decorative. Besides being used to store fruits, these are items that can be used to add a touch of beauty in the dining room, living room and kitchen. If you are looking for a shop where you can buy a custom resin fruit bowl, Petcarl-Décor is your one stop shop.